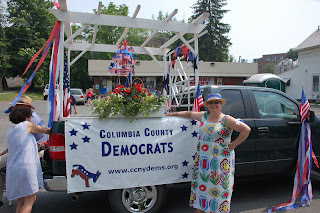 Thanks go out to all of the Columbia County Democrats who participated in the Hudson Flag Day Parade on Staurday June 14th! 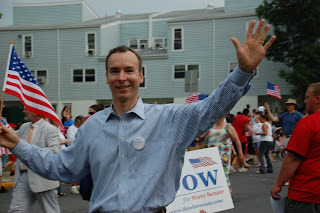 Special thanks to Cheryl Jones, Bob Sacks, Rhonda Granger and Cyndy Hall for the beautiful float ... and to the 30+ marchers and helpers who braved the humidity and long wait; a huge "thank you." 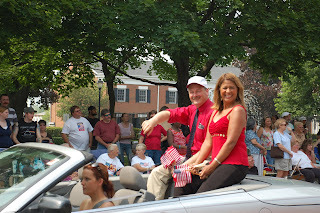 Ernie Reis, our official CCDC photographer was on site taking some great shots too. 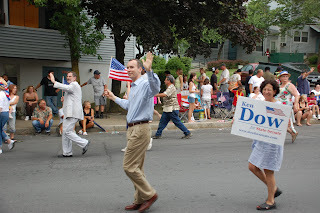 Among the marchers, led by our Chair, Chris Nolan, and Vice Chairs, Cyndy Hall and Bob Sacks were: Ken Dow, NYState Senate candidate, Richard Koweek, Hudson City judge candidate and Sean Gavin and Kevin Cassidy from Congresswoman Gillibrand's campaign. 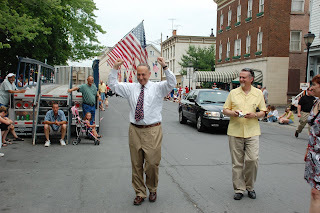 Senator Schumer was in attendance along with our Town Democratic Supervisors. 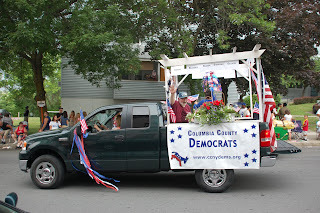 Columbia County Democrats looked great!